What is Fisheries, Wildlife and Conservation Biology? Interested in working with wildlife? Fisheries, Wildlife and Conservation Biology prepares students to manage and protect populations of fish and wildlife in their natural habitats. This STEM (Science, Technology, Engineering and Mathematics) major gives students the skills they need to observe, research, monitor and assess the impact of environmental change, human behavior and public policy on animal populations. Using a combination of lab work, technology and field study, students develop conservation strategies that ensure the long-term health of fish and wildlife populations. This program is a great fit for students with a passion for wildlife and the outdoors looking for research, conservation or environmental careers. Students will have many opportunities to get outside while studying Fisheries, Wildlife and Conservation Biology. 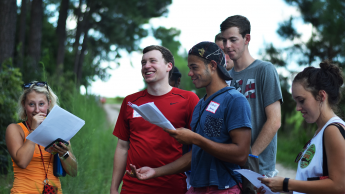 After sophomore year, students spend six weeks in the field at “Summer Camp,” an experience unique to the College of Natural Resources at NC State. During this unforgettable summer, students learn hands-on fish and wildlife management techniques in locations across the state. From plant and animal identification and bird mist netting to camera-trapping and radio telemetry, students gain experiences that prepare them for careers after graduation. Throughout the year, class field trips include behind-the-scenes exploration of the Smithsonian, animal autopsies at the NC State College of Veterinary Medicine and overnight trips to the Smoky Mountains. 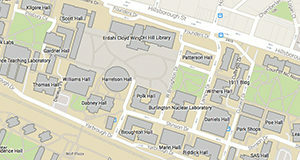 The student-run Leopold Wildlife Club and Student Fisheries Society provide opportunities for professional development, networking and social events. With a number of natural resources agencies located within 20 minutes of NC State’s campus, students have access to a variety of valuable internship opportunities. Students also gain hands-on work experience and internships at the N.C. Museum of Natural Sciences in downtown Raleigh, the largest natural science museum in the Southeast, and the N.C. Wildlife Resources Commission, headquartered on NC State’s campus. Students in the wildlife concentration graduate with the coursework necessary for the Associate Wildlife Biologist Certification from The Wildlife Society. Popular minors include Animal Science, Forest Management and Zoology. As the second most productive Fish and Wildlife Research Program in the country, our students assist with research projects focused on habitat management, citizen science, wildlife health, adaptive resource management and quantitative ecology. Why are Fisheries, Wildlife Management and Conservation Biology graduates important? Americans spend more than $145 billion on fish and wildlife-related activities each year. Our graduates play a critical role in supporting the local economies and communities throughout the country where these activities thrive. With thousands of animals threatened globally by increases in urban areas, climate change and non-native invasive species, our alumni research and develop conservation actions to preserve biodiversity in local areas and around the globe. By helping to preserve the area around rivers and streams, our graduates do more than conserve fish and wildlife habitats, they also protect our water supply for both drinking and recreation. Working to ensure the long-term health of fish, wildlife and domestic animals, our alumni help prevent the spread of diseases between populations, which protects human populations as well. Our residential Summer Camp engages students in practical application of classroom concepts. Fisheries, Wildlife and Conservation Biology major Rebecca Sears spent 3 weeks of her summer in Namibia, where she developed and practiced her field skills and sampling techniques in the African savanna. What can you do with a fisheries, wildlife and conservation biology degree? 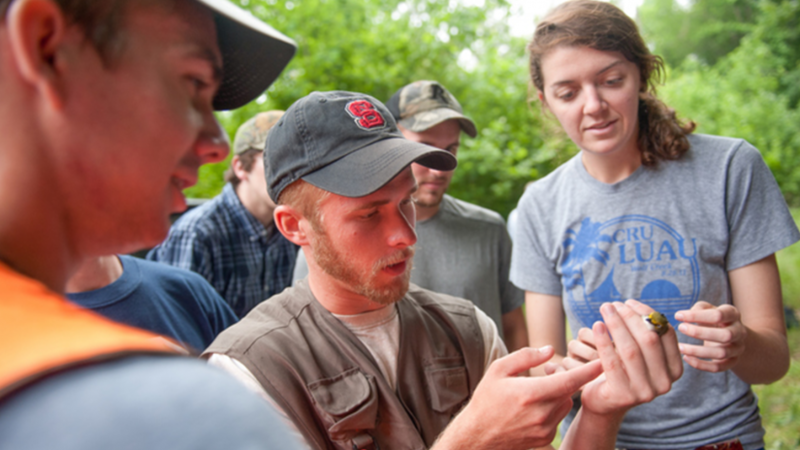 Our Fisheries, Wildlife and Conservation Biology majors graduate with options. From pursuing careers in the field with private industry or the government, to continuing their research at the graduate and Ph.D. level, our graduates go on to pursue their passions. Wildlife Biologist – Work with state and federal agencies, such as the U.S. Fish and Wildlife Service, North Carolina Wildlife Resources Commission, the Department of Defense, and North Carolina State Parks, to direct habitat management and population monitoring that is critical to wildlife conservation. Fisheries Biologist – Work with state and federal agencies, such as the National Marine Fisheries Service and the North Carolina Wildlife Resources Commission, to responsibly steward fisheries resources to sustain healthy populations and recover threatened populations, while allowing economic and recreational opportunities. Conservation Biologist – Work with non-governmental organizations and government agencies to protect threatened and endangered species and their habitats. Program Manager – Work with organizations, such as the National Audubon Society, The Nature Conservancy, and Ducks Unlimited, to develop conservation plans and work with partners to purchase conservation lands, manage habitat, monitor populations, develop public relations, inform environmental policy and provide education and outreach. Wildlife Enforcement Officer – Work with state and federal agencies, such as the North Carolina Wildlife Resources Commission, the North Carolina Division of Marine Fisheries and the U.S. Fish and Wildlife Service, to enforce wildlife laws and ensure the safety of visitors to refuges and other wildlife management areas. Wildlife Damage Specialist – Work with agencies, such as USDA Wildlife Services, or private companies to manage wildlife damage and resolve human-wildlife interactions with the goal of maintaining stable wildlife populations in harmony with human populations. Research Technician – Work with universities, state or federal agencies to collect data as part of a research program aimed at conserving fish and wildlife. Management Technician – Work with state or federal agencies to manage habitat on wildlife refuges and other wildlife management areas or with consulting firms such as J.H. Carter and Associates to carry out Habitat Conservation Plans and Safe Harbor Agreements. Environmental Educator – Work with museums, parks and nature centers to share knowledge of wildlife with children and the general public. Environmental Consultant – Work with a private companies, such as Calyx Engineers or Duke Energy, to review development projects, consider environmental policy and recommend actions to ensure conservation of plants and animals. Many of our students choose to continue their research and education by pursuing graduate degrees at universities, such as Clemson, Auburn and Virginia Tech. Fisheries, Wildlife and Conservation Biology major Lindsay Clontz spent a summer in southwest Wyoming as a Deer Elk Ecology Research (DEER) project technician. Fisheries, Wildlife and Conservation Biology major Jacob Veilleux interned with the with the Illinois River Biological Station in Havana, Illinois, where he focused his time studying Smallmouth Buffalo fish.